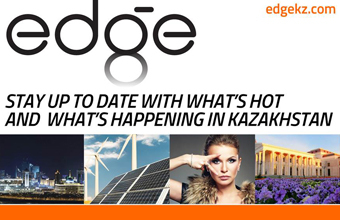 ASTANA – Kazakh sculptor Kadyrkhan Kakimov has created more than 90 works of art displayed across the country. He believes public spaces should be filled with beauty, because it makes people’s lives lovely and thoughtful. The monument to Abu Nasyr Al-Farabi in Turkestan. Photo credit: advantour.com. “The public spaces should be full of aesthetic works. Not everyone is able to visit museums. It will be food for thought and influence people’s behaviour,” he said in an interview with Kazakh TV. A master of stone art, Kakimov was born in a small village in East Kazakhstan in 1952. After school, he entered an art school in Almaty where he took classes with sculptor Vagif Rakhmanov. “I really liked stone as a material. Stone teaches people, because it is hard material. Before clashing once, you should think several times, because once deformed, it cannot return to the previous shape. You need patience for that,” he noted. Since childhood, the sculptor cut figurines and toys from wood. He has always been influenced by his surroundings – the highlands of the Altai Mountains, rock figures resembling people, dancing birches and pines growing on stones played a key role in shaping his perception of forms. The monument to Sultan Beibarys. Photo credit: bibliotekar.kz. “Nature in East Kazakhstan is very beautiful. It is mountainous and rich with greenery. Rocks and stones are stunning. Thus, seeing such rocks, it is impossible not to become a sculptor,” he said. Kakimov continued his education at Moscow State Academic Art Institute named after Vasily Surikov, graduating in 1977. He studied in the studios of sculptors such as Mikhail Baburin and Nikolay Tomskyi, and the opportunity to visit major international galleries and museums had an effect on him. “I think Moscow’s society, museums and galleries enriched my personality and influenced me to develop as an artist,” he said. Few Kazakh sculptors work with stone, noted Kazakh artist Bakhytzhan Myrzakhmetov. “Marat Ainekov and Rakhmanov worked with stone. Other artists usually work with bronze. But, for example, if you make Sultan Beibarys’ monument in Atyrau from bronze it will be totally different than what it is now,” he said. Kakimov’s main interest is history; thus, most of his works are related to historical figures. “I’m mostly interested in history. After the independence of Kazakhstan, many materials about our history were unveiled. I became curious. The Emshan poem by Moris Simashko inspired me when I was making the monument of Sultan Beibarys,” he said. The 15-metre monument, made from granite, is situated in Atyrau’s central square. It is separated from the wide alleys by a series of granite steps, standing on a hill between a hemisphere yurt with Kazakh tamgas (abstract seals or stamps) and a pyramid with engraved symbols of Egyptian culture. The monument has become a kind of artistic symbol of the city. 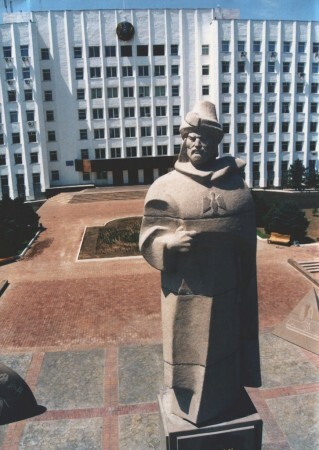 His other works include monuments to Oriental philosopher Abu Nasr al-Farabi, Kazakh writer and thinker Abai Kunanbayev and writer Oralkhan Bokeyev (both located in the East Kazakhstan region) and academician Umirbek Zholdasbekov, the founder of the Kazakh school of robot mechanics, theory of mechanisms and machines in Almaty. Kakimov also created several monuments of Kazakh batyrs (warriors) Karasai and Barak, who fought against Zhungar invaders. Karasai’s batyr monument is located in the region of the same name near Almaty; Barak’s is in the Karauyl-tobe Mountain in the Kurchum district of the East Kazakhstan region. He also crafted a monument of Shakshak Zhanibek batyr, a famous biy (judge), on display in Kostanai. 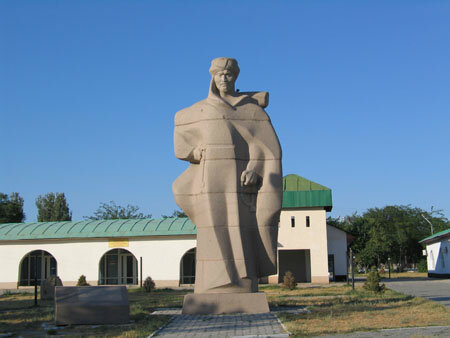 The sculptor also has works related to issues of the modern world, such as the monument in Taraz symbolising the power of love. It is a tribute to the love story of two young people, Bolat and Ainur, who studied together in the United Kingdom and planned to marry. They were killed in a plane crash returning to Kazakhstan in 2006 and a year later, the monument was raised in their memory.